We are in the apartment, the house is SOLD, and I am exhausted! I really do plan on putting updated pictures up... just as soon as I can find the camera. :) It was down to the wire, but we did manage to get everything out of the house before closing today. We are so blessed to have the friends and church family here who are always eager to help out. We couldn't have done this without them! A ton of our stuff is now sitting in a storage unit, and there are piles all over the apartment just waiting to be sorted. I have a feeling we will be making more trips to deposit "junk" in the storage unit before this is all said and done. The goal is to have it all sorted and settled before Casey leaves in November! I don't have a single recent picture to share, but I do have this quick video of Abby and her friend, Claira, dancing to the "Hot Dog" song on Mickey Mouse Clubhouse. Heaven help us--we have discovered cable TV. 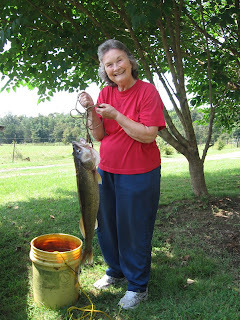 Ok, so I didn't catch this fish--Mamaw did! 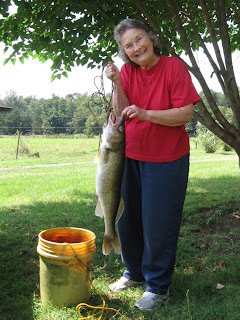 I'm sure Dad has emailed these pictures to some of the family members, but in case you haven't seen it, here is Mamaw with the 10 lb. walleye that she caught while fishing with Dad this past weekend! I will try to write more later when things calm down a little. We're currently trying to get moved out of the house and into the new apartment, so things are a bit chaotic. Stay tuned for pics of the new apartment!